Impractical Jokers is the best! LARRY!!!! Iâve been watching TRU, Carbanaro and IJ for a pretty long time or as long as I got into it/remember... even got my Dad/ Grandparents to watch it! Casey and the Jokers are so funny!! Sal is currently my fav joker! Love it when he falls laughs and when heâs afraid of Cats! Lol! Anyway, long live the Jokers! TRU Tv rocks!! LARRY!!! Cranges Mc Basketball?! Anyone who likes this crap is retarded in real life. If you love the show, you will love this Podcast detailing all kinds of behind-the-scenes info. If youâre not really into the show though and are just looking for a funny Podcast, this will probably disappoint you.Its appeal is interesting information about the show. Itâs not very funny on itâs own.Side note: This Podcast will actually get you to like Casey Jost. I know, but try it. Iâm a HUGE IJ fan and this podcast is for people like me who enjoy meeting the crew who make the show run smoothly. I also like learning how punishments and challenges come together. As a huge fan of the show I love the podcast because it talks about my questions I've had about the show like how do they do it and what do each person do. 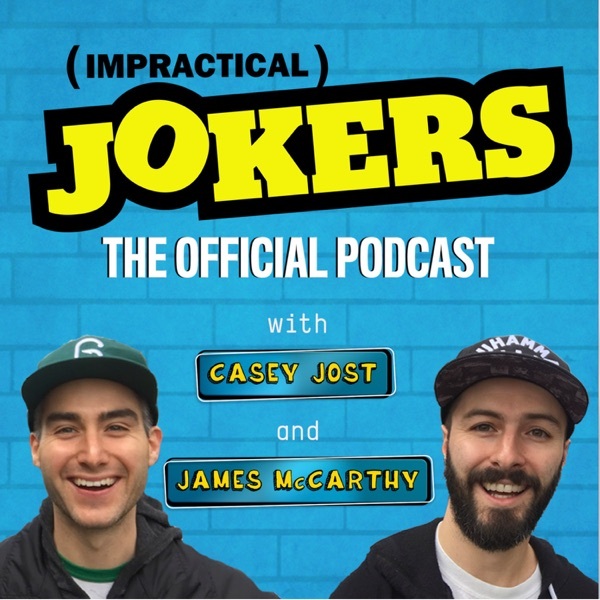 Casey and James (and Dannygreen... one word) give some great behind the scenes anecdotes and insider perspective into the big beautiful world that is IJ. The âstarsâ pop in every once in a while for more fun, but the insight and commentary on each episode is a great thing to make a podcast out of. All the bad reviewers must be trolls, because TOIJP IS WHERE ITâS AT!! I hung in there with it, and itâs getting a lot better than before. Love that the Jokers are on more. I subscribed to hear behind the scenes info about each episode. However these hosts prefer to talk about anything else 99% of the time. They get easily sidetracked and go on and on about topics that have nothing to do with the jokers. The priemere of Season 2 of this podcast is the best one yet ( Marathon Man)! Funny, engaging, worth a listen every time! Keep up the awesome work guys! This is a great companion podcast to each week of IJ. Led by Casey Jost, you get inside info on each episode and the production of the show. I can't stand that last segment of the show (Inside Jokers or whatever) as it is. Either the other reviewers aren't really listening to this podcast or I haven't listened to enough (heard 2) because this podcast is NOT hosted by the Jokers but rather some of the people producing the show. And Casey that does the last segment, who I don't care for at all. Not good. One of my favorite shows on tv but this podcast is nothing like the show. It's about 5 or 6 people you never heard of talking about their personal lives. Super boring, if they just talked about the show with maybe just one guest it could be a great podcast. So please change it up. Like the podcast. When I first heard I thought it would be the 4 guys from the show doing it and was disappointed when it wasn't. But the people who do it are good and they have some of the guys from the show on here and there. Keep up the good work. This podcast is just another attempt at the guys to try to continue to "promote" their show. There is also no real reason to get invested in this because, as usual, the guys will drop the ball on any podcast they do. Joe will have to go tend to his babies, Murr will need to go find new hair, Q will have to go find new watering holes, and Sal will need to go off on the comedy circuit. The guys had their good "The Tenderloins" podcast years ago, but gave up on it. Q & Sal had their cunning "What Say You" but they abandoned it. At some point this show expands too much to where us fans can't keep up even if we wanted too. Seriously, now we have the main show, an after party, an inside jokes, web chats, a new IJ podcast (and the old abandoned podcasts). Season 7 may be their last if they desperately keep trying to "promote" the show. The Royal Dansk of podcasts! A fun podcast with great stories! I like the extra insight into what goes on behind the scenes. Interesting behind-the-scenes info. It's a must listen for fans of the show! We love the production crew just as much as the 4 jokers ! Thanx for sharing you guys are great! And so funny too !!!! I love the show and I love this podcast! Keep doing these! I love the tv show and would love the podcast if the jokers were apart of every episode. Joe and Murr episode was just amazing and I hope for more of that. Love the show and love them!!! Love the show and this has become one of my favorite pods to listen to during the day. Keep it up guys! Love this so far! Keep it up! A cacophony of unjustified self laughter for the soft of brain to join. Just trying to promote their show, which is funny, but this is not. I'd rather have that What Say You podcast than this trash. What a let down! Love the show and love the podcast! Had on blast at work, even my Boss came on it and told me to hook it up to the speakers and turn it up! Glad Sal, Q, Murr, & Joe are involved in a podcast again. I cannot wait to hear more. Love this show.. .and now I love hearing the behind the scense stories in the podcast. Impractical Jokers, I knew you'd come! "This will go to the stars"
I've been waiting for this podcast for a long time. Really funny and well produced and hearing the stories and opinions of Jokers cast and crew really adds a lot. I can't wait to get more! This podcast is hilarious so far! I can't wait to hear about the episodes and get more of the jokers!!! I've been listening with visual aids to this podcast for years on my TV. Now I can do it without being stuck in one room and I don't even have to open my eyes! Saves energy! Brilliant! !